These Brussels sprouts might be just an excuse to eat bacon but with Thanksgiving upon us, they are also the perfect side dish for that traditional Turkey. This is not a Paula Peck recipe but rather an adaptation from “The James Beard Cookbook” by her good friend and mentor James Beard. Although Brussels sprouts are more popular now than ever, it seems people either love them or hate them. If you hate them, than you probably haven’t tasted those that are cooked right. These bright green bulbs can be bland and mushy when overcooked but are tender with almost crunchy light leafy layers when cooked correctly. A little bacon doesn’t hurt either. 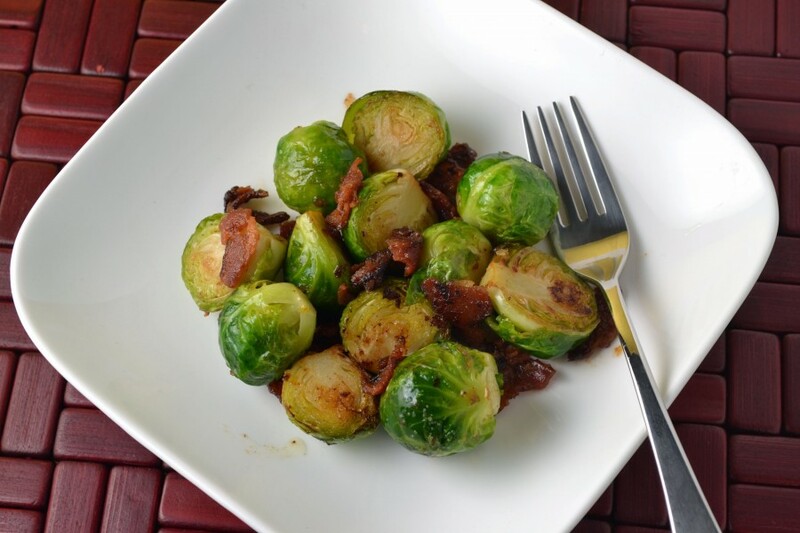 With just a few additions, brussels sprouts with bacon is the perfect example of the important culinary concept of balancing fat, acid, sweet, and salt. The fat is the bacon (obviously) plus a finishing of butter…just a tablespoon. The sweet is both the brussel sprouts themselves as well as a pinch of sugar. The acid is a squeeze lemon juice at the end and the salt is the seasoning combined with some of the saltiness of the bacon. Ok so I didn’t say this is healthy but at least we are eating vegetables! Even those friends or family members that “never eat green things” will be back for seconds. This dish might also be in the running to outshine that drab dry turkey and stuffing. Now I’ve gone too far…Happy Thanksgiving. Trim the stems close to the sprouts and remove any discolored leaves. Soak the sprouts for 15-20 minutes in water with 1 teaspoon salt. In a medium pot, pour enough water to cover the brussels sprouts and add 1 teaspoon salt. Bring water to a boil and add sprouts. Do not cover. Cook gently for 5 minutes until sprouts turn bright green and are just barely tender when pierced with a fork. 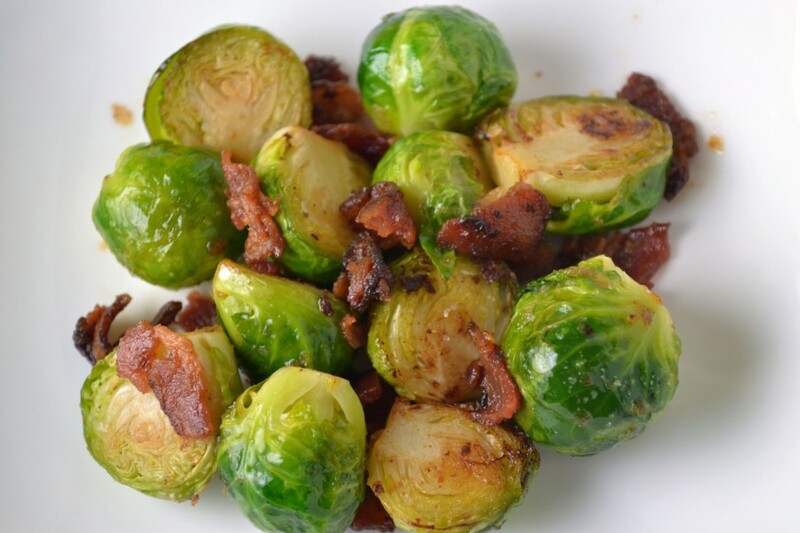 While brussls sprouts cook, fry the 6 slices of bacon in a large skillet. When crisp, remove and chop. Drain off all but 2 tablespoons of the bacon fat. Heat the skillet over medium heat. Add 1 tablespoon butter and 1 tablespoon grated onion. Return chopped bacon to the pan and add the cooked, drained brussels sprouts. Add sugar and saute until brussels sprouts are tender. To finish, add 1 tablespoon grated onion, squeeze lemon juice, and season with salt and pepper to taste. Adapted from “The James Beard Cookbook,” by James Beard. Hi Megan, I’m generally a brussel sprout hater but these look so good that I think I’ll give ’em a try for Thanksgiving. I know that they are very popular at Thanksgiving, so I hope they turn out well. Who knows, you may make me a believer!!! Thanks for sharing the recipe. That’s great Valerie, thanks! Let me know how it turns out.